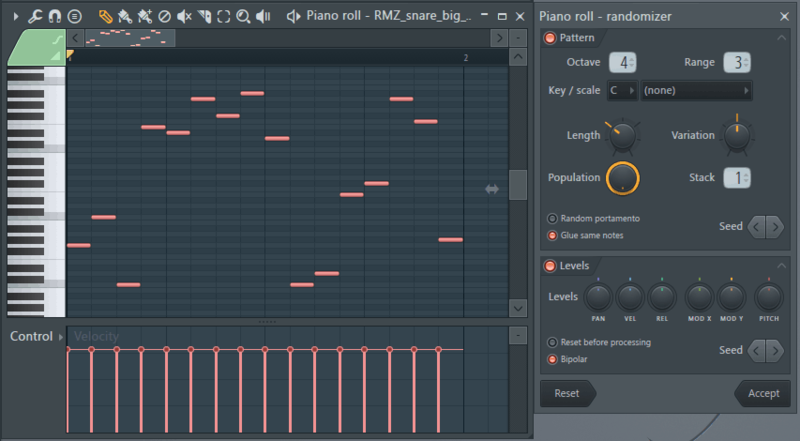 The FL Studio Piano roll has a neat feature that allows us to save time and add random and subtle variation to the velocity and volume of each MIDI note. This effect will end up making your piece sound more like a human made it, and less like a computer. Let’s check it out. When a pianist plays the piano, we call the speed at which he or she strikes the keys the velocity. The velocity alters the tone and volume of the key being pressed. Pianists consciously change the velocity of their key strikes while playing depending on how expressive they want each note to be. On top of that, human error ensures that there will be a slight variation in the velocity of each successive key, even when the pianist is trying to make them sound the same. 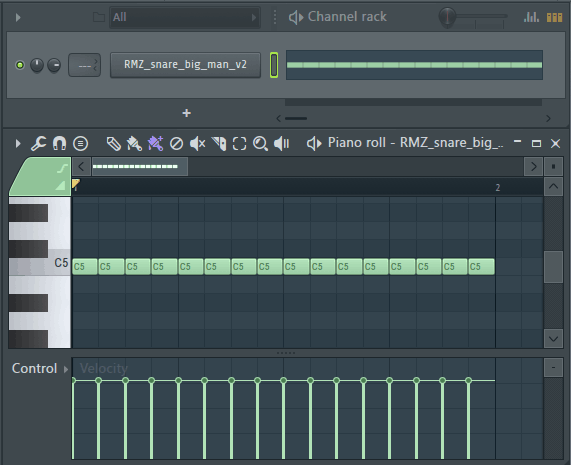 We can use velocity randomization in FL Studio to more closely imitate a real performance. The overall process is called velocity randomization, and the Piano roll tool we can use is called the Randomizer. First, choose an instrument, and then open its Piano roll. Keep in mind that this technique will work for drums too, since each drum hit will never have exactly the same velocity/volume of another in a real performance. For this example, I’ll be using a snare drum. I programmed the snare to be triggered on every step. We can see the velocity data for each note in the velocity window. Notice how they are all exactly the same. We could go in and manually change each one, but this would be tedious and time consuming, especially if there are lots of notes. With the Randomizer tool, we will add some variation using a computer algorithm to speed things up. The Claw Machine is a tool used to add variation in note lengths and triggering while maintaining the overall length of the progression. This is great for spicing up your drum and percussion patterns. We can open the Claw Machine by pressing Alt+W on the keyboard while the Piano roll is open. Just choose a period that’s less than or equal to the period that your note progression takes up, and then mess with the Time distortion knob and Trash every setting to shift the note lengths. Hit the Spacebar to preview the new pattern. You can end up making some really interesting patterns for your drums with this tool. OK, the moment we’ve all been waiting for. The keyboard shortcut for the randomizer tool is Alt+R. Make sure the Piano roll is selected, and open it up. You’ll notice that this tool can randomize velocity and also create randomization for note locations too. As a default, the Pattern randomizer is on. We only want to randomize velocity, so turn it off for now. Just click the orange “Pattern” button at the top left of the Randomizer window. Bipolar – changes whether or not the velocities will be randomized to both higher and lower levels, or just higher levels above the starting positions. To randomize your snare velocity, just turn the VEL knob left or right. I found that around -20% or 20% creates a noticeable difference. You can also change the Seed and bipolar options until you have something you like. Press the Spacebar to preview it, and then hit Accept when you’re done. OK, we’re all done. Let’s compare the original progression with the new one. The difference is subtle, and adds a little bit of human touch. It’s the sum of small details like this that separate a good production from a great one. If you liked this 100% free FL Studio tutorial, let me know what else you’d like me to cover in the comments, on the Synaptic Sound Facebook page, or YouTube channel.